What kind of stuff was this dude using? Why didn't he just call the breakdown truck? Why did his friends let him drive away? There's no answer, but just to make sure, they got in the car with him. Do you know what my biggest concern is? In just a few days this might become the most popular video on the tube containing the words "Audi" and "stuck" in the description. But believe me, there are several others you should check out featuring Audis, for example the ones driven by Stuck (Hans "Strietzel" Stuck). Those are more worth the time. 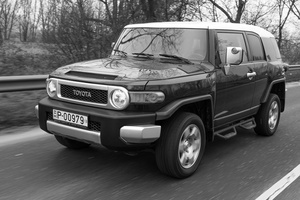 The Toyota FJ Cruiser is a rare sight in Europe but we had the opportunity to test one.